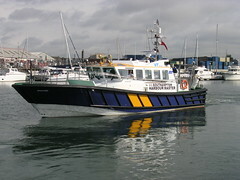 Just recently, John swung by in his new patrol boat - Spitfire. It certainly looks a big improvement on the old patrol boat. John's visit serves as a timely reminder that it's high time Lady Jane went out for a spin. The whole workshop project is coming along nicely. You can see in the picture the gluing up of the first half of the door. I put extra supports in the middle of the door to help prevent it from warping. After putting glue all over the first half, I then immediately glued the second side on. 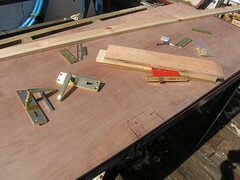 It's obvious I don't have enough clamps, so had to resort to using whatever heavy weights I had to hand. In retrospect, the extra supports in the middle were probably unnecessary, as the door is now pretty heavy. To late to change anything - short of startting again that is. Giving the Old Sow some tender loving care in the bottom department has been long overdue. 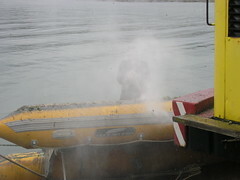 My experience with jetwashing the underside of the rib has taught me that the underside of boats that stay in the water for any length of time need regular cleaning. The more often the better. 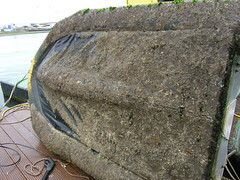 The build up of marine growth you see attached to the Old Sow is an indication that I've let things go just a little too long. My old jetwash was useless, so I had to start this particular task with the purchase of a brand new one. I've already killed two Karcher jetwashes in the time I've had Lady Jane, so opted for a Bosch one this time. Only time will tell if it's going to survive. Early indications are that it's a good one. So good in fact that I think I'm going to have to hide it from Fred, who you can only just see through all the spray there, as he seems inordinately fond of jetwashers. The net result of all this blasting away at the poor unsuspecting critters that had made the underside of the old sow their home is a transformed old sow. Initial testing has the sow once more skimming gracefully upon the ocean wave... Get real - it's still a pig, but a clean one. One thing though, there seems to be seawater coming in from somewhere now. It's probably from the fitting for the home made bars the previous owner put on. I've made a start on the door to the workshop space. By way of sizing, I've made sure that it's bigger than every other door on Lady Jane. Still, it does look small when I'm stood by it, as it will be installed some way above deck, so you have to step into it, like you do the rest of the doors on board. 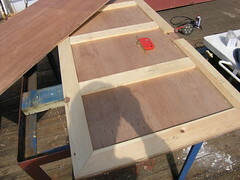 As you can see, I made up a trial section with two bits of ply and a bit of wood in the middle. This 'trial' piece helps get the dimensions right for the frame, along with checking the hinges, handles and locking mechanism for size. 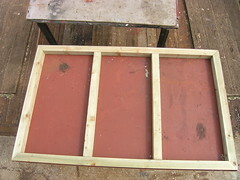 The plan is to glue the whole thing together, fit the frame, then finally hang the door. I'm not to worried about making the door, nor am I worried about making the door frame. What worries me is fitting the two of them together! 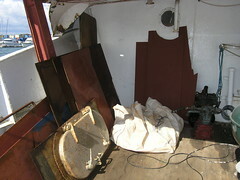 I've been drilling a series of holes in Lady Jane's bulkheads, to make way for the new wiring for the workshop. 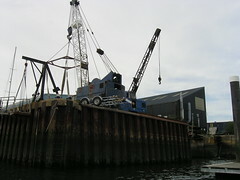 The upshot of all these holes is the installation of a proper ring main to the forward part of the boat. The third hole you see is for the energy efficient 24V lighting I'm planning on installing. The picture also shows one of the newly installed, but yet to be wired in, weatherproof sockets I now have. 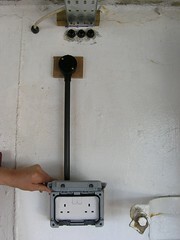 An even more completely weatherproof socket has also been mounted on deck. I'm really looking forward to finally having sockets available where I'm working with power tools on board, instead of trailing extension leads all over the place. I saw this and just had to post it. There is so much wrong here. I try to always wear a life vest, but confess I rarely wear my kill-chord (it's always such a hassle). You obviously need both! Changing the way I do things and clipping the kill-chord to my life jacket, like I've seen Ken from Maggie Best do, should fix this completely. Andy came down for another visit. 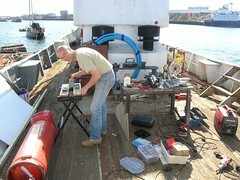 This time to help with getting mains power into the new workshop space I'm creating on board. The huge advantage of having Andy help is his insistence on doing things right. If it was left to me, there would probably only ever be an extension lead trailing through to the workshop. If I was feeling really enthusiastic, I may even have routed it below decks somehow. Needless to say, doing things right needs power tools of every description. You would not believe just how long it took to tidy up after this particular day's work. The poor old table you can see in the background is now in such a sorry state it just has to be replaced. 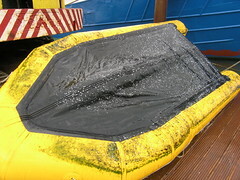 Despite my best efforts, the slats below the protective covering have been falling out. Somewhat reminiscent of those prisoners bunks in the great escape. Also, the legs are now so wobbly it's not even safe to try to sit on the table, let alone do any work on it. I was originally going to replace the table with a new, wooden, one. After thinking it through, and a suggestion by Fred, I've opted for a wooden frame with an overhanging wooden top, probably plywood, attached. You can see the frame that Fred built slotted neatly onto the steel table below. This gives me the flexibility to do either steel or woodwork on the same table, simply by changing the top. Yes, that poor old table has also been on fire on account of cutting steel plate on it with oxy-acetylene. All I need do is remember to take extreme care when using the circular saw on my new wood top. I've made a start on the frame on the port side. At the bottom, you can see I've welded in a piece of angle iron to hold everything in place down there, without needing to worry about the wooden deck. I did the welding of the angle iron using some of the low hydrogen welding rods left by the contractors. I had been told that using the rods was 'quite tough', as the flux tended to melt and flow over the electrode after stopping welding, making it hard to subsequently arc up again. After some experimentation, I found that keeping a small flat file nearby, then cleaning the flux from the tip of the electrode before restarting welding was all it took to produce consistent, good welds using these rods. Reading up on low hydrogen rods on the interwebs, I see that the whole idea of the rods is to keep moisture from getting into the welding process. From what I can understand, relatively high levels of moisture in the welding rod yields a high hydrogen content in the weld, which in turn makes the weld weaker and susceptible to cracking. 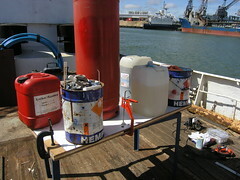 As far as storage of my welding rods on Lady Jane, all the fancy low hydrogen rods count for nothing as I've just kept the rods in their open packets, lying in a crate in the stern compartment. Apparently the first step in keeping the moisture content in welding rods low is to store them at high temperature after opening the packet. Obviously a problem for me here with no power on during the week, and very conscious of overall power consumption on board. I've seen some disparaging remarks about the effectiveness of using a small box with a 100W light bulb in it. It seems that for the purist, only a special purpose oven kept permanently on will do. I think there must be a better option - vacuum packaging the rods when not being used maybe, and only heating them just prior to use? My personal view on all this is that none of welding I've done so far, or intend to do in the immediate future, is critical, so the storage of 'wet' rods is not really an issue. I may, though, think of a way of storing them better and heating my rods before/while using them in future. This seems like a reasonable compromise. If I'm to do any welding that could be critical in future, I guess I'll have to consider buying smaller packs and simply opening a new packet of rods just for those jobs, then keep them heated while the job is on. All interesting stuff to learn about though. Despite my best efforts, my deck is even more untidy than before. Here you see lengths of 2*2 scattered about, the last of a load of new wood I've shipped out to Lady Jane. 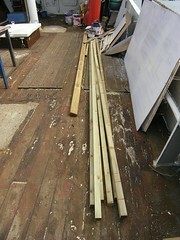 This wood, in part, is going to be used in the construction of my new workshop space. The new sheets of plywood have already been stashed inside, out of the inevitable wet weather. I've got how I'm going to do it pretty much mapped out in my head now. The toughest part is most likely going to be the doorway. 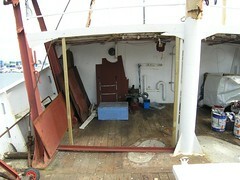 I know it doesn't look it, but the deck space on Lady Jane is getting progressively more tidy again. Another run to the council tip should see the rubbish, which I've been storing in tins on deck, gone sometime soon. The plan for the space you see under the whaleback is to cover it over, such that it then becomes a workshop. This workshop would then replace the sheltered working space I had with the gazebo, which I really miss. The advantage of the new workshop space will be that it should be useable in almost any weather, which was never the case with the gazebo. It's becoming apparent that I'm again spending a summer dodging the rain clouds. Here you see the finishing coat of blue over the patches I welded in last year. 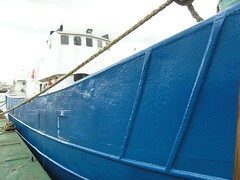 I initially painted over the patches with blue, then re-painted most of the forward part of the starboard side. While there are still a few slightly rusty spots I'm working on up forwards, I'm pleased to say that overall the previous paint job on the hull has held up extremely well. I'm now thinking about replacing a large section of the steelwork in the middle of the starboard side, as it's always been paper thin. Hmm, I suspect I'm going to need some help with this. Here's the generator after assembly. This was actually put together last week but, because of the interest I've sparked, I wanted to wait until I had a decent picture and more details on the maker before posting this. 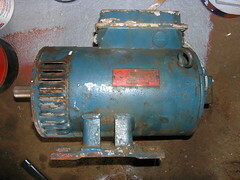 My generator is a rather battered looking version of one of these Transmotor generators, a 100amp DCG-55 EVR to be precise. What really surprised me, though it shouldn't, was just how silky smooth the generator shaft now turns in it's new bearings. 12 quid (say 24 US$) for the pair. Turning the shaft before changing the bearings gave a kind of grinding feel, and the generator had been running really hot, however when I took the bearings out they both felt like they turned smoothly with no noticeable play in them. Anyway, because of that, I was starting to doubt that just replacing the bearings would revitalise the generator. Now, after seeing a shiny new one, I'm almost inspired to give mine a lick of paint before putting it back into service.